We are often asked about our favorite products, toys, supplies, brands and more. I’ve been thinking for awhile about putting together another list of favorite things and figured with the holidays approaching, it’s the perfect time to share links and discount codes. Many of these links (in the blue font) are affiliate or associate links, and purchases made through them help to support our family and allow us to continue to inspire and connect with all of you. So, I want to say ‘thank you’ for the support, love and kindness you all show us. METALLIC PAINT – I got so many questions on this Instagram post about what kind of paint we used. Well, this beautiful piece was created with the classic brand – CRAYOLA! I love the little paint tubs and we have most of the colors but the metallic set is really something special. 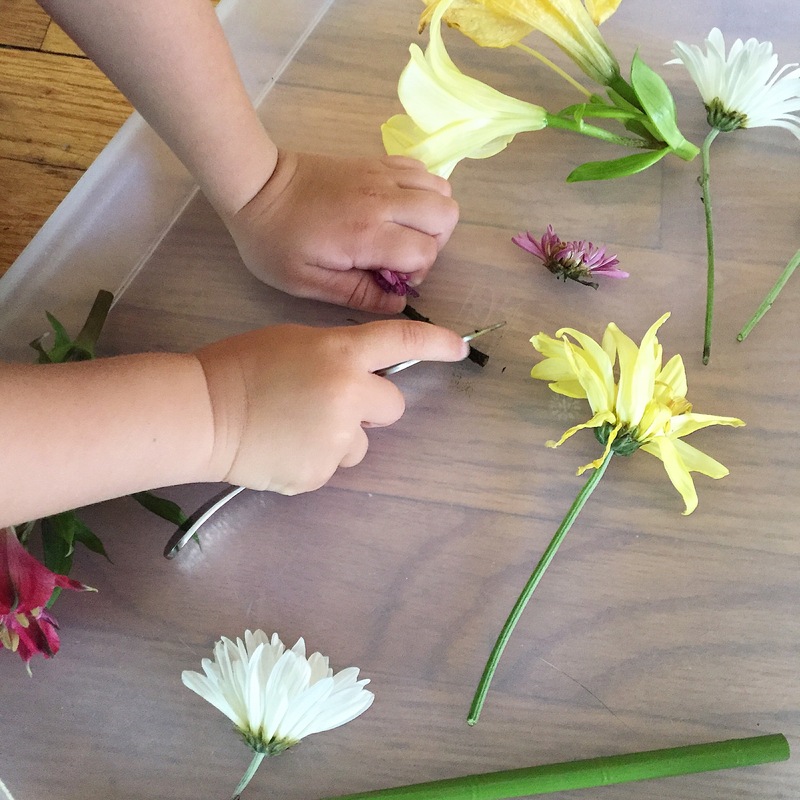 The tubs are the perfect size for little hands to open and close, move around, and to get to the bottom with a paint brush. WATERCOLOR TRAVEL SET – This past summer we travelled to California and I put together a travel journal kit for my boys and myself. I was really impressed with the watercolor set that I purchased to go along with our kit. It’s super compact but the quality of the paint is high and the colors are so vibrant. We loved having a paint set with us to document our travels. OOLY – We recently received a big box of amazing art supplies from OOLY and while we loved everything that we’ve tried so far, my 4.5 year has fallen in love with the Mumbo Jumbo Markers paired with the Oh My Ombre Mini Journals. He loves that the markers come in a box with a little handle and he carries it around from our art shelf to his desk to the floor to the table. And maybe it’s because he’s somewhat ‘mini’ himself, but he just loves these little journals and fills up the pages one by one with his drawings and observations of the day. We bring both of these items to his big brother’s soccer games and out to restaurants. Even Mama got something in the box of goodies from OOLY – a Filpside Notebook! And I usually carry around the Color Luxe Gel Pens in the Pencil Pouch for both myself and my kids to use. 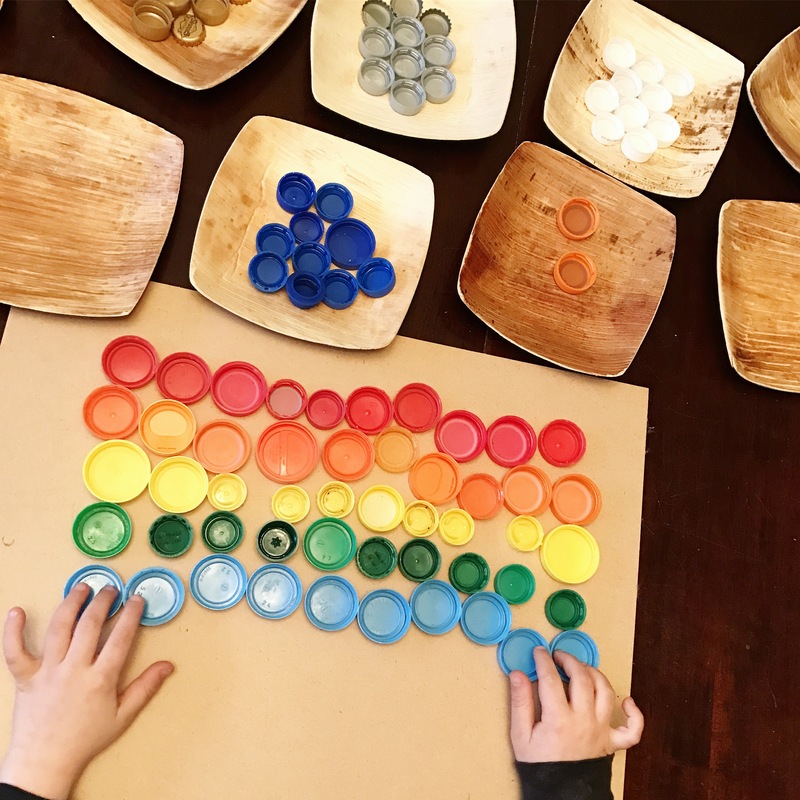 So, that means children can continue to add to their creations for days and it saves money because you don’t have to continue to replace hardened clay or play doh if (when…) it gets left out accidentally. 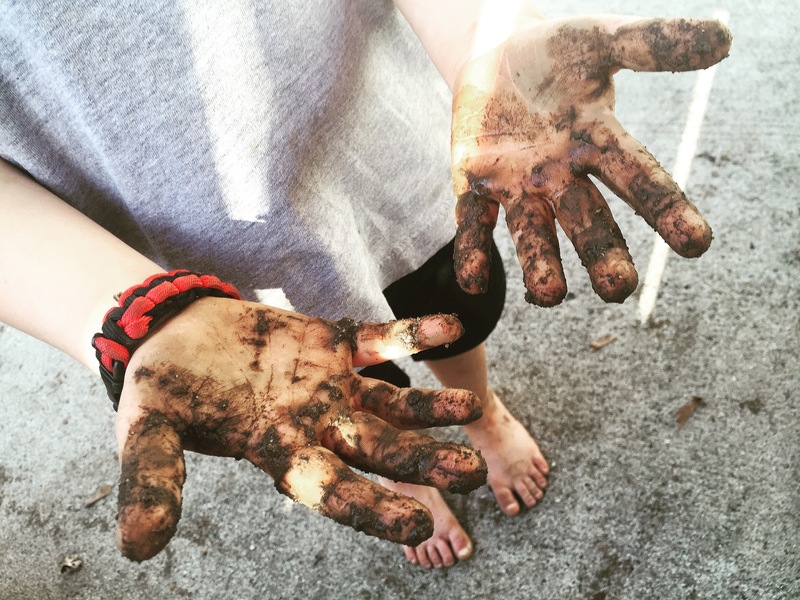 I also love that it is hard and encourages both fine AND gross motor development (that’s how hard it is!). You might, in fact, think I’m completely crazy when you first open the package because of how hard it is but, trust me, once your kid gets going, it loosens up a bit. It is also a great material for those that need some sensory input. SPIN ART – For some reason, we just discovered salad spinner spin art this year. 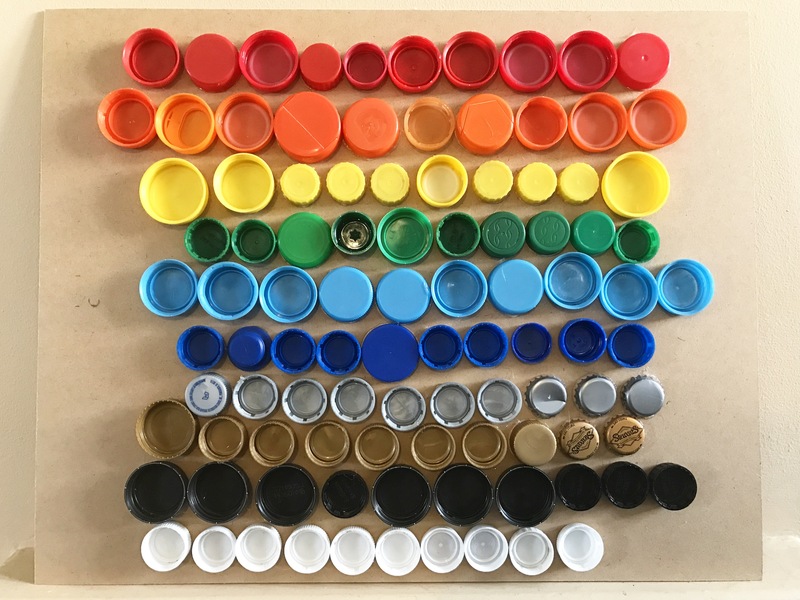 I purchased a salad spinner, squeeze paint bottles and placemats from IKEA and we all fell in love with this super fun art project. I love the products from IKEA but if you can’t get there or don’t like shopping there, I found some similar products on Amazon for you. This salad spinner looks comparable in size and these squeeze bottles can be filled with paints you already have. There are loads of tutorials, hacks and endless ideas on how to take your salad spinner spin art to the next level, just search on Pinterest! TRAVEL EASEL – During one of my many thrifting sprees, I found this amazing portable wooden easel. I found the same one on Amazon to share with you all after getting so many inquiries about where to purchase. I got mine for $5 at the thrift store, but I’d absolutely pay the $15 they’re asking on Amazon. It’s a great piece to have to bring to the park or the beach and it makes my kids feel quite official. Pair this with the travel water color set for a great gift! SEWING – Another new favorite activity is sewing. We’ve started off slow and easy by using burlap, yarn, plastic needles and embroidery hoops. 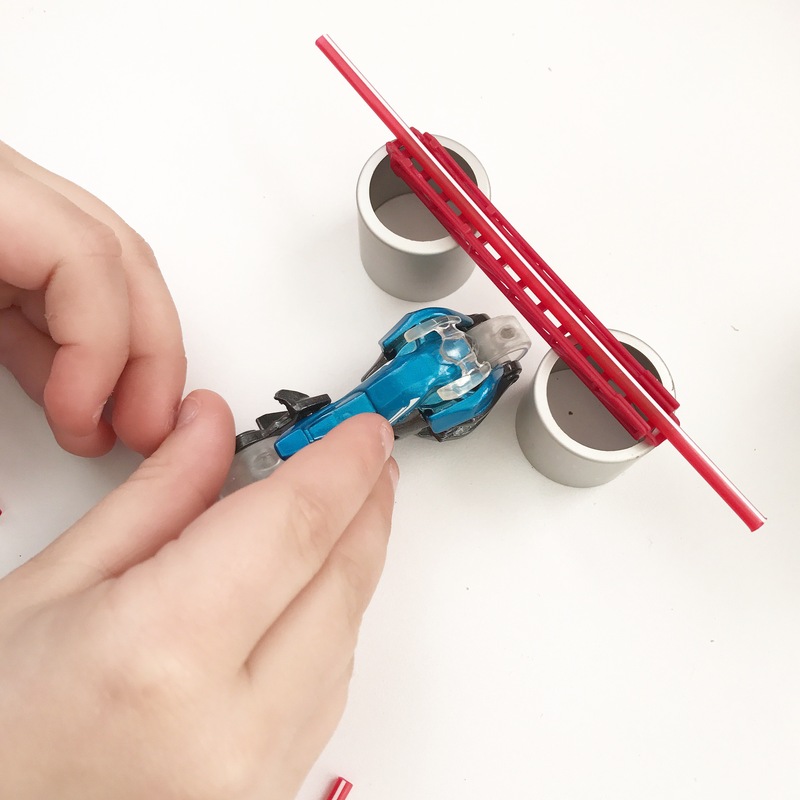 FAT BRAIN TOYS – We recently partnered with Fat Brain Toys to share some of their amazing products but we have loved a number of them for years. In particular, we have had and used their Twig Block Set for about six years now. 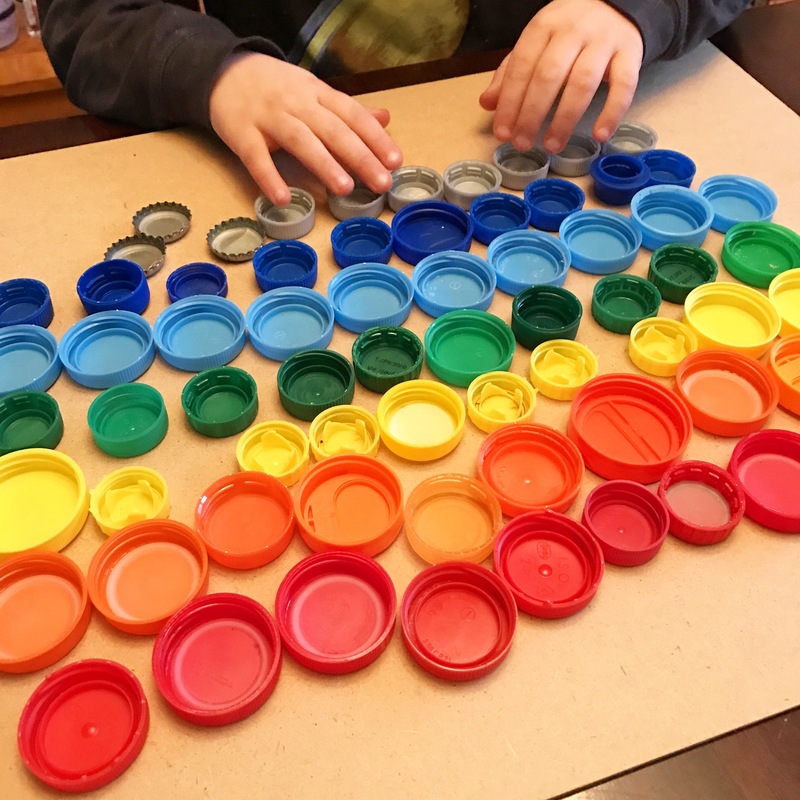 My kids use them to stack and build but also label and sort colors, practice balance, use fine motor skills, work on hand eye coordination, play with geometry, symmetry and other general math concepts. Their unique design allows for added levels of imaginative play, including storytelling. BELLALUNA TOYS – We recently received an amazing set of Grimm’s wooden blocks from Bella Luna Toys. The blocks are superb quality, gorgeous, bright colors and my boys just love them. Bella Luna carries so many wooden and Waldorf inspired toys. 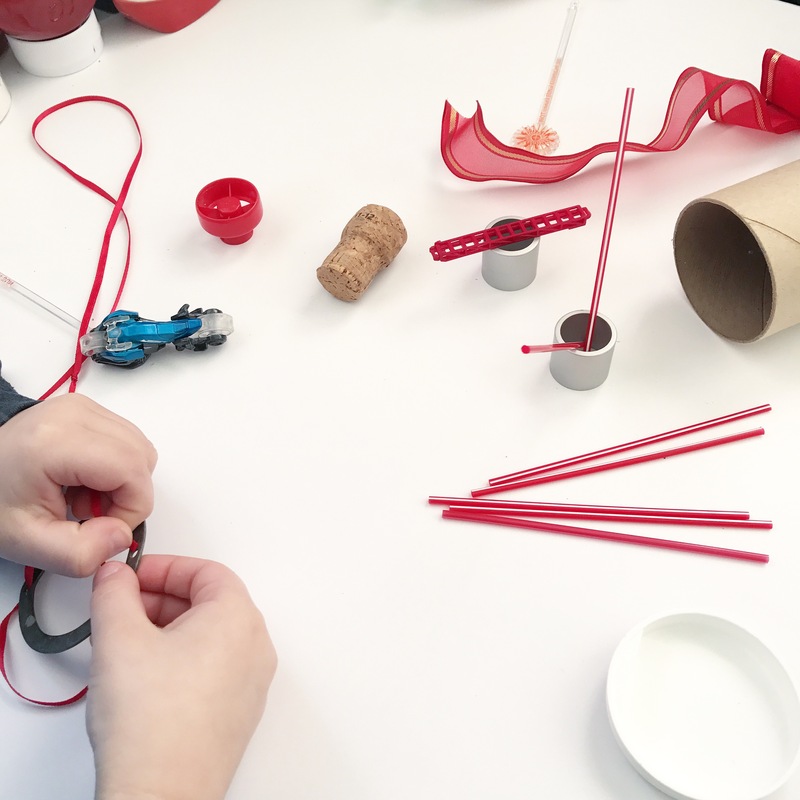 LITTLE MISS WORKBENCH – My friend Michele, the owner/designer/builder and all around toy making genius, is offering Naturally Curious Children followers an amazing holiday discount. But, first, I need to share some of our favorites. Our first LMW toy were the Mali cameras and they have become a staple. They come with us on adventures at the beach, occupy bored passengers on long car rides and are just beautiful to look at when just lying around on a table or hanging up ready for the next journey. The fishing pole set has also been consistently played with since it landed on our doorstep. I keep a chalkboard phone in my purse at all times. And know that when you purchase something from Michele you are buying a lovingly, hand crafted toy and helping to support a lovely family. 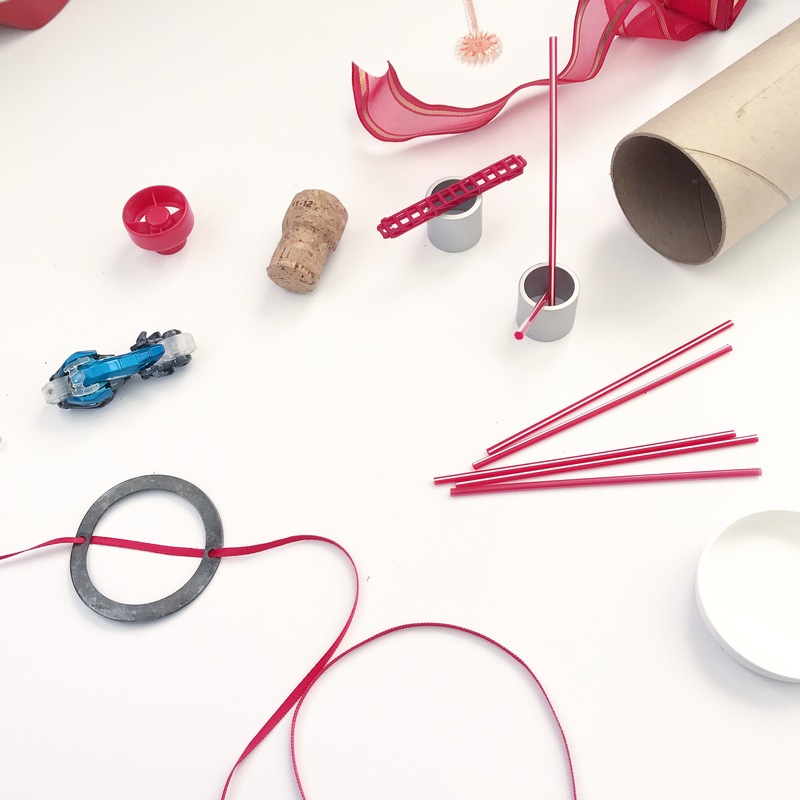 MIRUS TOYS – Another super sweet, small business owner recently sent us some of her amazing toys and I am blown away by their beauty and craftsmanship. It’s clear that Suba makes each piece with love. Her shop has educational materials and fun toys for all age levels. KAYAK – One of the best gifts we’ve ever received was this kayak. My oldest got it for his 6th birthday and took to it immediately. 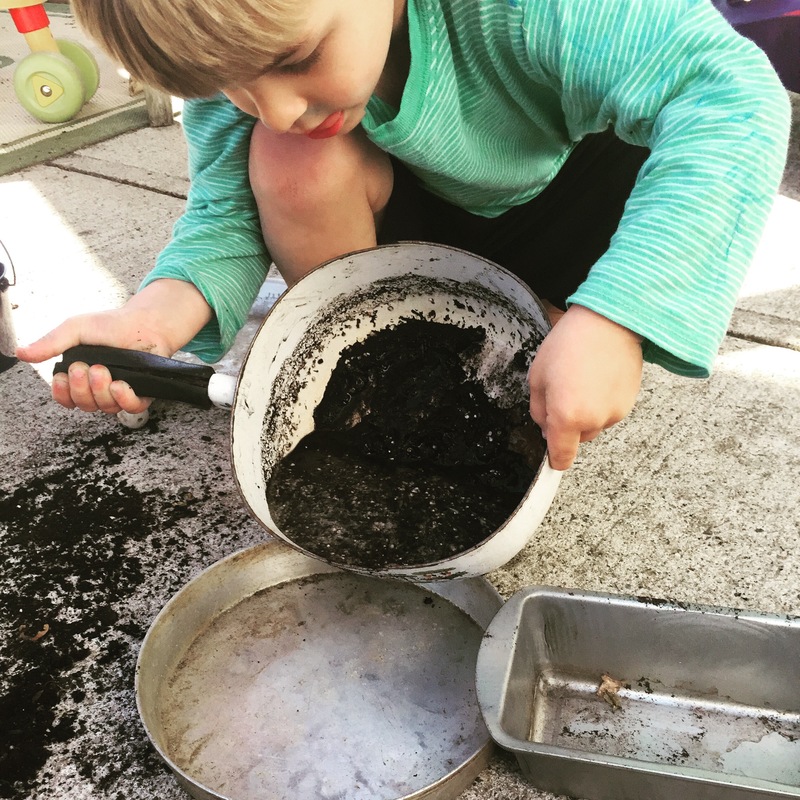 Every kid who’s tried it has been able to learn quickly how to manage it and has a blast. If you spend any time by the water, I recommend getting one. BEACH WAGON – And one of the best items I’ve purchased for myself is my beach wagon. I have used this guy SOOO much. It maneuvers well in the sand and holds so much. It’s also easy to pull, my 7 year old pulls it the long walk from the car to where we park ourselves for the day. The best part though is that it folds up easily and slips right in the trunk. We’ve even mastered carrying the kayak on top of the wagon for the walk to the water by using a bungee cord over the top. WATER BOTTLES – Not necessarily a summer only item, but we particularly love these Contigo water bottles because they keep our drinks ice cold all day at the beach, even when sitting in the hot sun. I feel like I’ve been searching for the perfect water bottle forever and I *think* we finally found the one that works best for our family. For me, they are easy to clean, you can randomly grab them for cheap on Amazon (always check all the colors, some get marked way down), and they keep drinks super cold all day. For my 7 year old, there is no plastic or silicone straw or spout to chew on. I’ve had to throw away so many water bottles that have been ruined by his sensory seeking chewing habit but this one eliminates any of that from happening. For my 4 year old, the 16oz size bottle works great for his littler hands AND he’s able to use it easily (some similar bottles have been difficult for him to maneuver). So, this one is a win for us all, hopefully it will be for you, too! BOLGA BASKETS – These beautiful, hand crafted baskets are just my favorite thing for storage and carrying things from here to there. 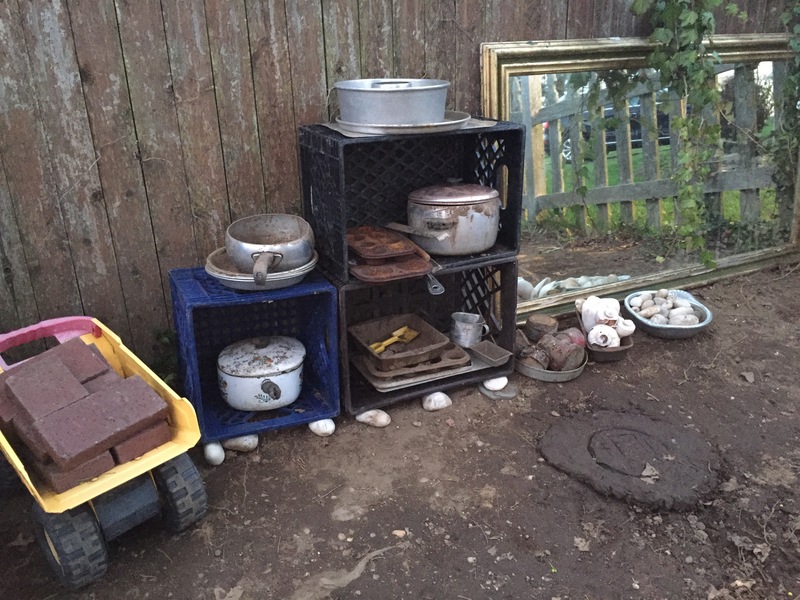 We’ve used them for blocks, books, art supplies, picnics, beach collecting (you can bring in the water! ), traveling and more. LUNCH BAG – I found these amazing lunch bags this summer and immediately fell in love with how gorgeous they are. Finding out that the images are created by artists from all over the world was a huge bonus. When we received the bags there was a card with a description of the artist and their work. We also got the elephant bag for my sister and learned that proceeds go to The Davide Sheldrick Wildlife Trust, another bonus! The bags are machine washable, lightweight and fit a ton. Pick one up for your kids and yourself! If you’re wondering what we’re wishing for this year, here are our lists! I’d started meditating as a way to focus and calm my own anxieties and noticed a real difference in the way I was responding to stress and chaos. 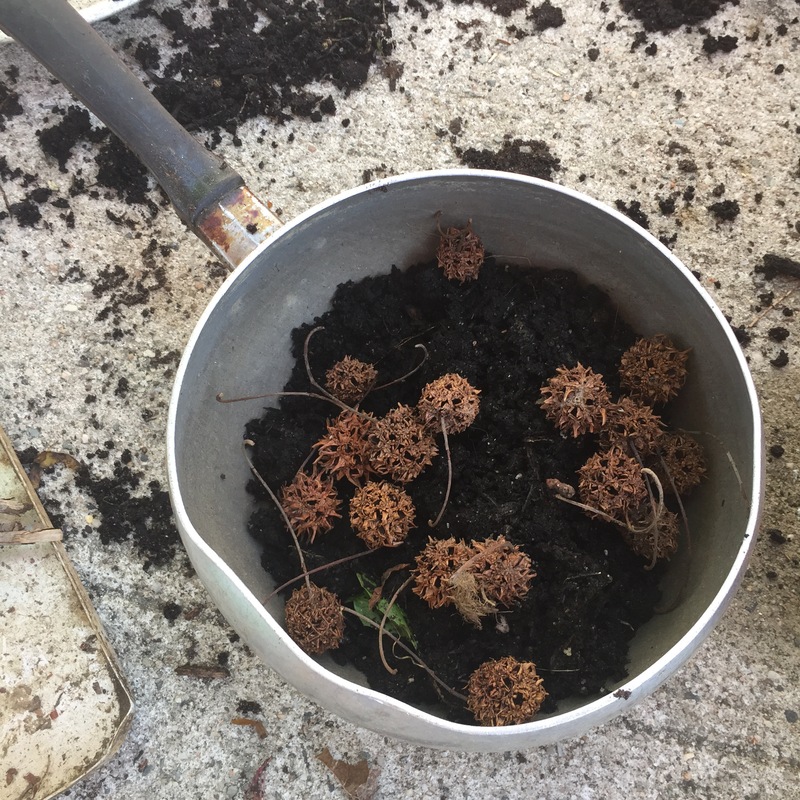 I decided to figure out a way to implement some form of mindfulness with my kids in the hopes that they would also benefit from the practice. 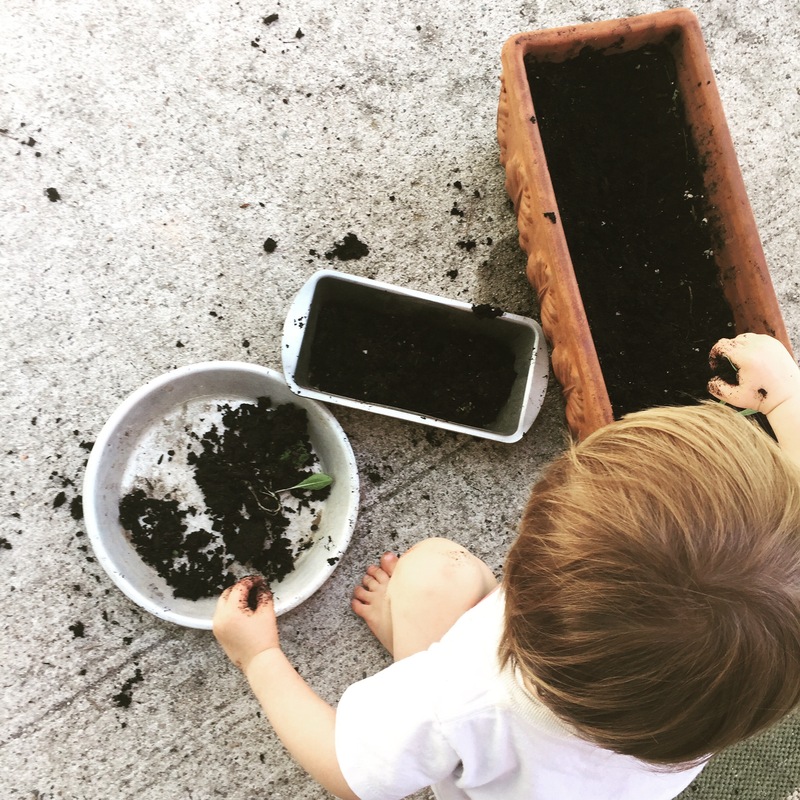 I started by collecting a few items that are used for mindfulness and meditation and while none of these are necessary to own, I felt that having tangible items would be helpful to get my kids involved. We explored these items as we got them so all were familiar by the time we started our daily ritual. I got a singing bowl for my last birthday and my 4 year old fell in love with it. He and I watched some YouTube videos and practiced making the bowl sing. When we use it together for mindfulness, we sit cross legged with our hands in a mudras on our knees, eyes closed and take deep breaths in and out. I will take a turn of making the bowl sing for about 60 seconds and we open our eyes when we can no longer hear the sound. If time permits, the boys each take a turn, too. We purchased a few crystals while on our most recent trip to California. I spoke with the woman who was selling them about how to know which crystal to choose, I was overwhelmed with the choices. She said that while each crystal is believed to have certain meanings and powers, it’s really just about what you feel drawn too. My 7 year old chose a sparkly, jagged crystal because he loves sparkly, shiny things and the texture was appealing to him as sensory seeker. My 4 year old chose a smooth, blue cube crystal because he liked the color and the way it fit perfectly into his little hand. We now have a small collection and the boys choose the ones that they feel drawn too that day. They do argue over some and usually have to promise to take turns. I’ve been using aromatherapy for a while now. For our daily routine, we use an oil of choice (sometimes made by me, sometimes by the boys) diluted in lotion and we rub our hands together, inhale and then massage into our necks and over our hearts. 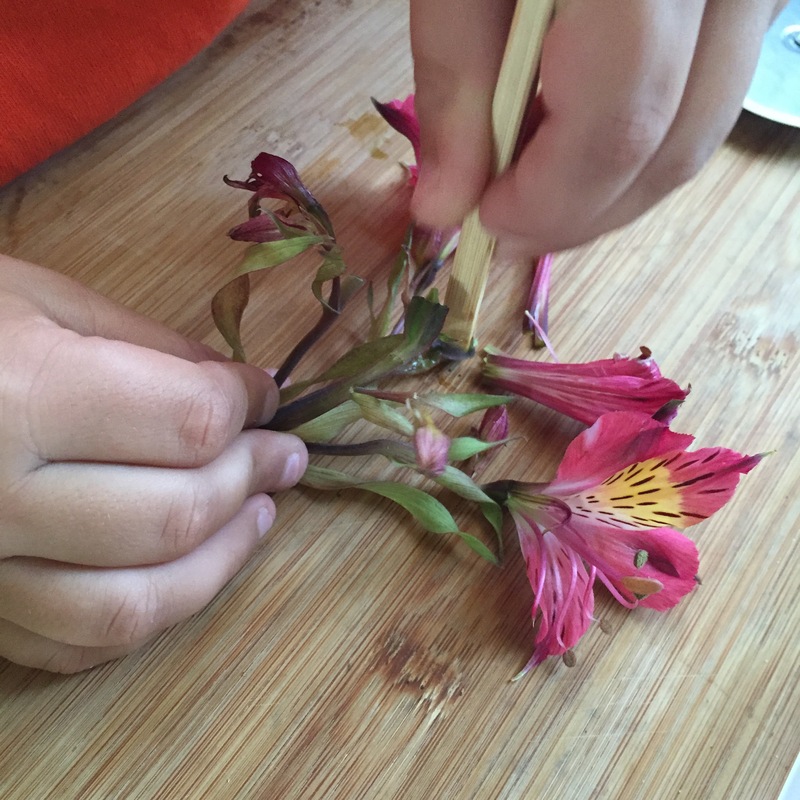 I use Plant Therapy oils and only those from their KidSafe line with my boys. I recently purchased the book I Am Peace by Susan Verde and Illustrated by Peter Reynolds. Sometimes I read the book out loud and sometimes they read or look at the pictures on their own. It’s a beautiful book with a powerful, peaceful message. Even if you don’t have a daily mindfulness routine, I suggest adding this book to your library. I stumbled upon the Figure 8 tracing board made at the Etsy shop, From Jennifer. I knew that my oldest son would LOVE this item but it has become a favorite for all of us. It has a calming effect for both the user and anyone who is watching. For us, practicing mindfulness is best done in the morning but this may not be a great time for every family or classroom. I like to dedicate 5-10 minutes each morning, but there are times when we are in a rush and either cut it down to 2 minutes or have to skip it all together. If we only have 5 minutes or less, we do a few deep breaths followed by an oil + lotion and I do the singing bowl for about 30-60 seconds. If we have longer, we’ll read or look at I Am Peace, do the Figure 8 board, and then everyone will have a turn with the singing bowl. We always end with our hands together and say ‘namaste’. The first week that we began with mindfulness as part of our morning schedule, they groaned every time. But, I pushed through and two months in, they are now disappointed to skip it when we are running late. When we do the singing bowl, they are supposed to sit quietly, breathing deep and as still as they can. At first, they had a hard time staying calm and focused with their eyes closed, especially my 4 year old, he was often overcome by silliness. But, as we kept on, with gentle reminders about the purpose of mindfulness, they both grew to maintain focus and calm. 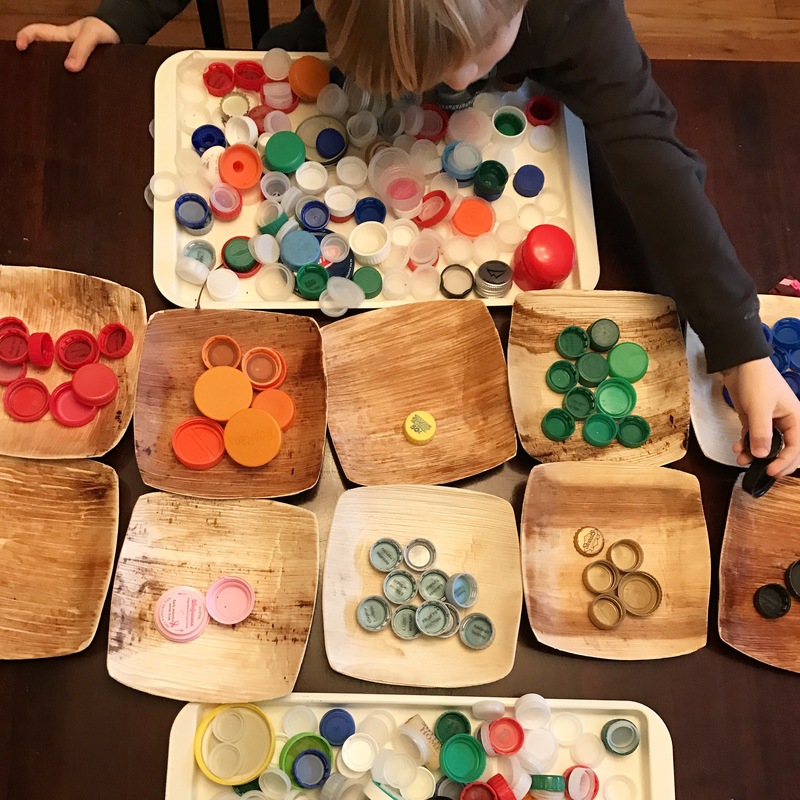 A while ago I was inspired by a post on Instagram from Jess at Tinker Tots where she shared her little box of loose parts that she takes along in her purse for her son. 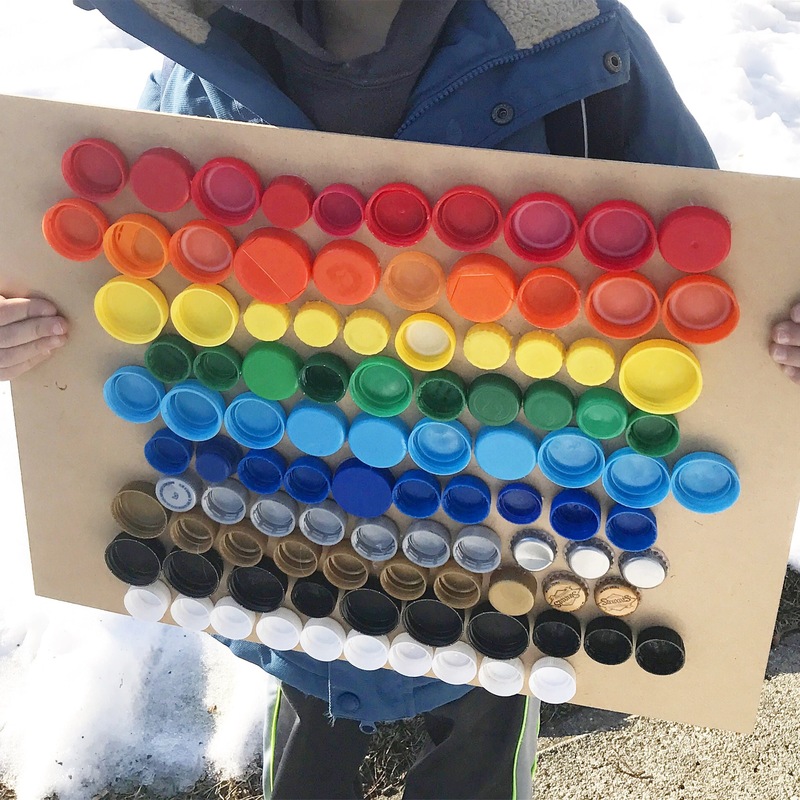 It took a while but I finally put together our own little container of take along loose parts and it’s debut with my boys was a huge success. I discovered a small cardboard shipping tube that I’d been saving for a long time and knew it was the perfect size and it could also be used as a loose part, itself. I walked around the house grabbing random items to fill it; a ribbon from an unwrapped birthday gift, the ladder from a broken fire truck, coffee stirrers and more. The only things I sought out were the two vehicles, a motorcycle and a helicopter. After we ordered our food, I told the boys I’d brought something for them to play with and they were instantly curious. 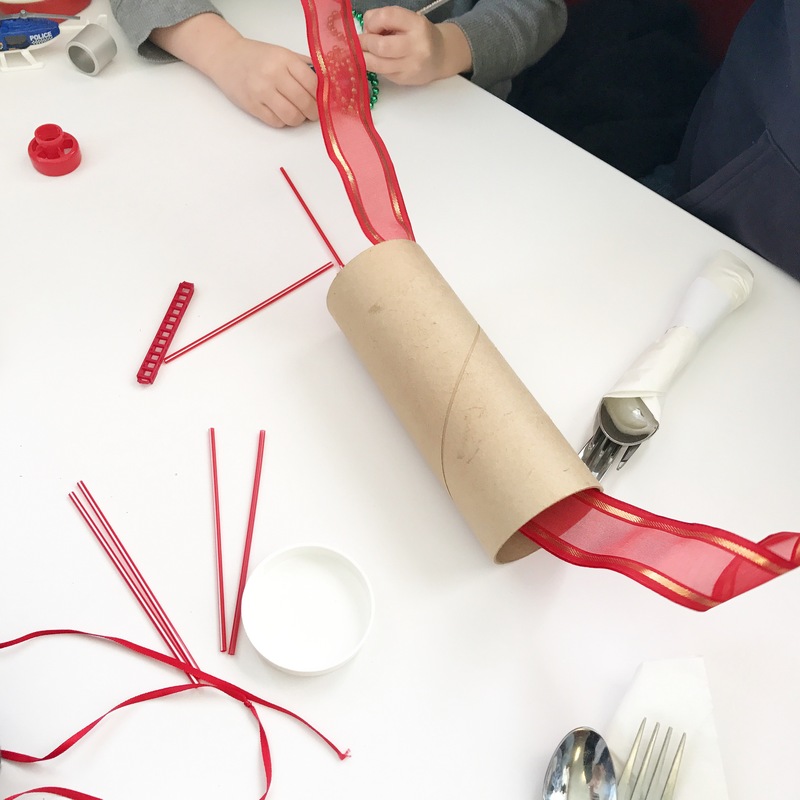 I put the tube on the table and they did not stop twisting, tying, stacking, creating or imagining until the pancakes arrived at the table and we had to quickly stuff everything back in it’s holder. I’m excited to keep this tool in my bag going forward. 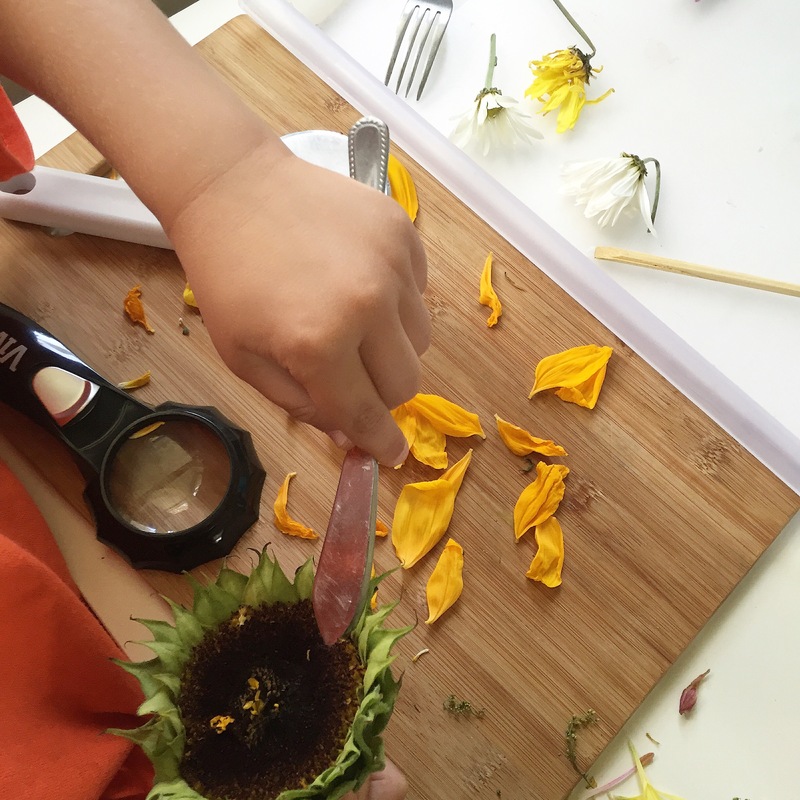 This isn’t simply about something to keep them occupied or out of trouble but rather the ability to provide them with open ended materials that encourage creativity, conversation, storytelling, and more while we are on the go and in any situation. 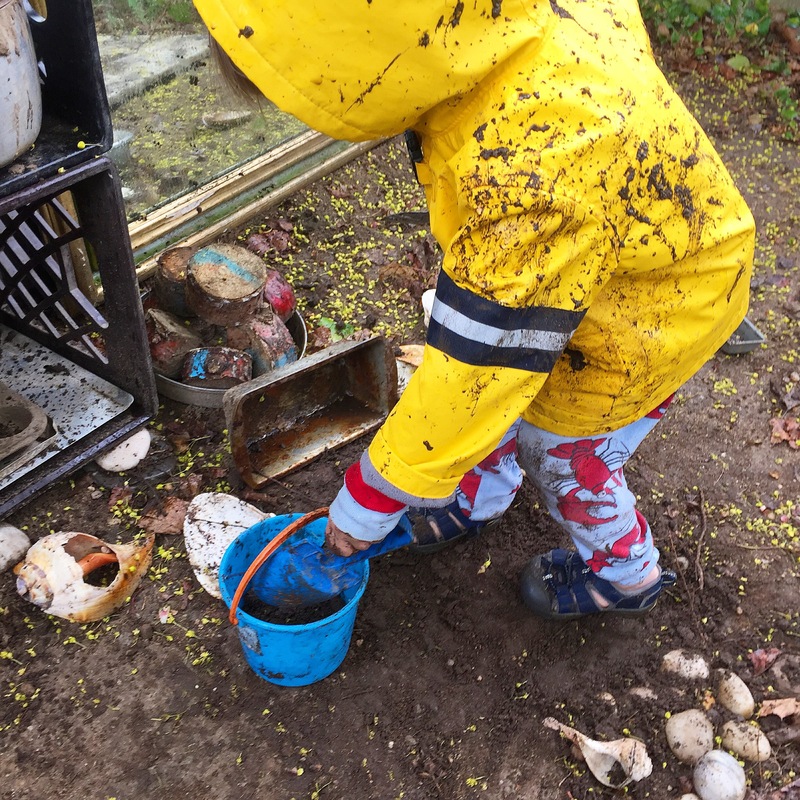 I plan on adding and taking away materials as needed based on how they engage each time we take them out. 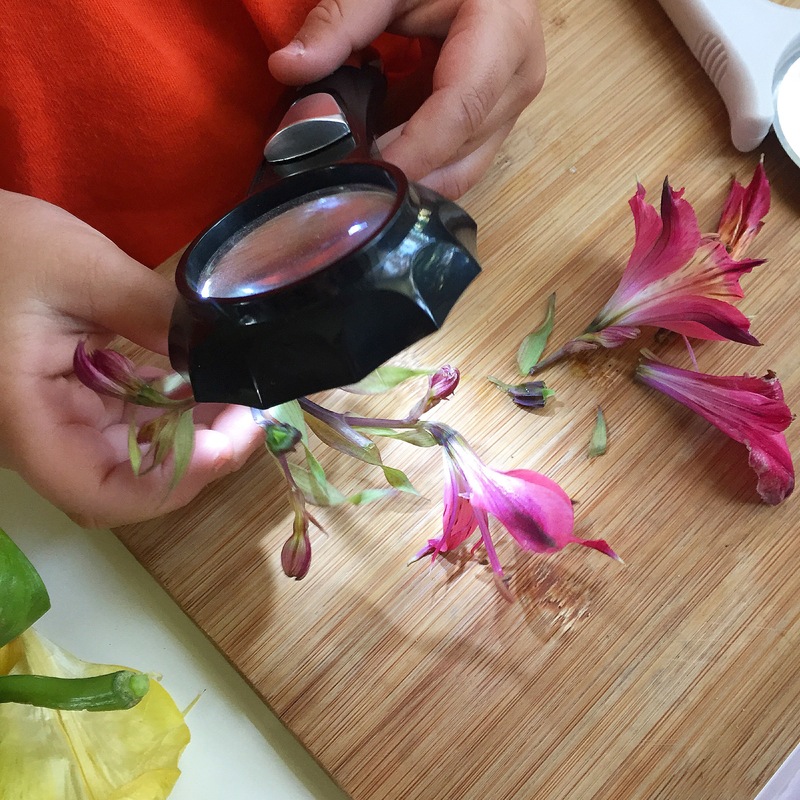 Using some mildly wilted flowers from arrangements we had in the house, I set up an invitation to explore for my boys, ages 6 and 3 1/2. 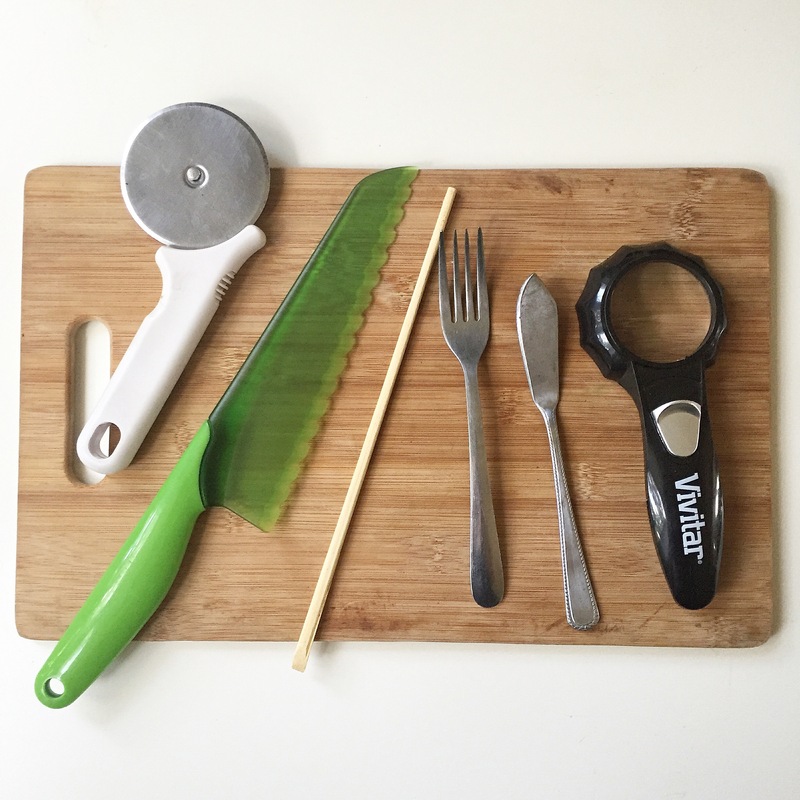 Some of the tools I included for the exploration included a bamboo cutting board, magnifying glass, child friendly knives, forks, chopsticks and a pizza cutter. Other items that I’ve used in the past are lobster pickers, meat tenderizer, potato masher and scissors. 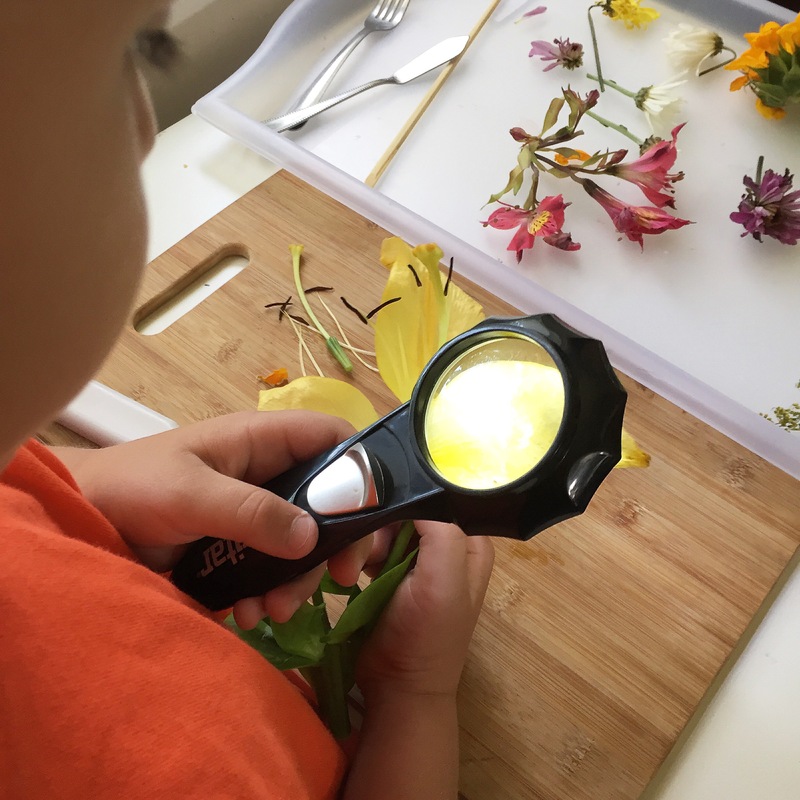 I particularly like the Vivitar magnifying glasses with the lights because we can see more detail even with dim lighting or on a dreary day. They also have a thick handle that is great for small hands. 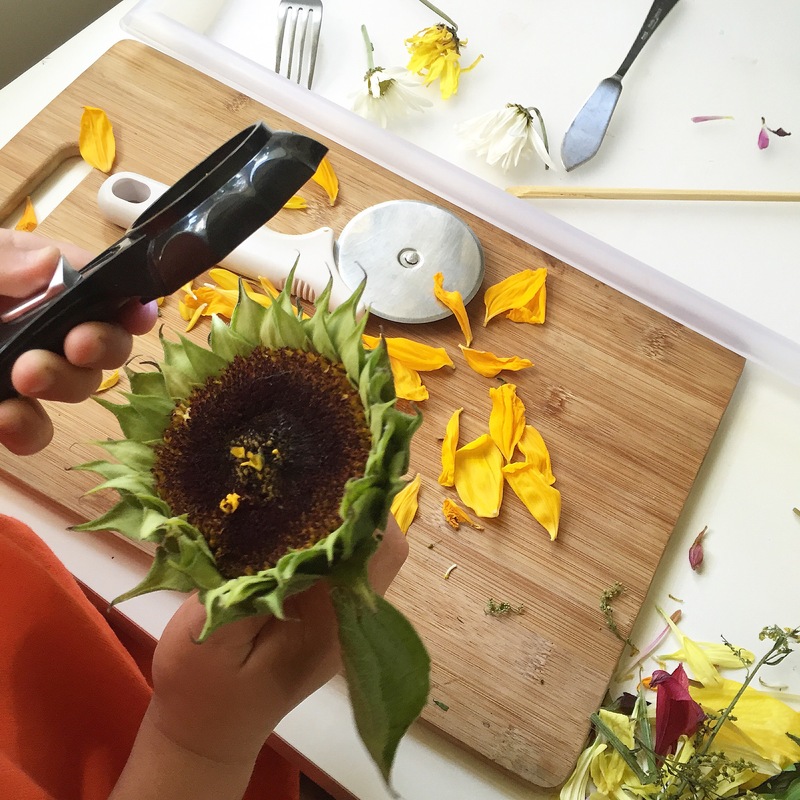 For knives, I always go back to our Zyliss lettuce knife as it’s been used over and over again by both boys. I also included butter knives and cheese spreaders that again, are great for little hands. I set everything up on my favorite plastic trays from IKEA. I have also used cutting boards and cookie sheets. The boys were free to pull, peel, chop, cut, slice, smash, poke, pinch, explore and examine as they please. I mainly stepped back, took photos and listened to their observations. The time the police were called to our house. Only a few people know this story because I was so upset by it when it happened. But, in light of recent discussions on blame, shame, accountability and the ever illusive ‘village,’ I am finding the courage to share. About a year ago, the boys and I were outside playing, as per usual. I’ll paint the picture as best I can for this specific day. We live on a cul de sac with five other houses and we are the corner property. From the time my oldest was learning to ride his scooter and balance bike, we came up with rules for how far to go on either side of the circle. Without fail, they know where to stop and turn around. During the day, our small street is usually empty minus one elderly neighbor and us; our cross street is also relatively quiet, only a few cars pass by each hour, I’d say. 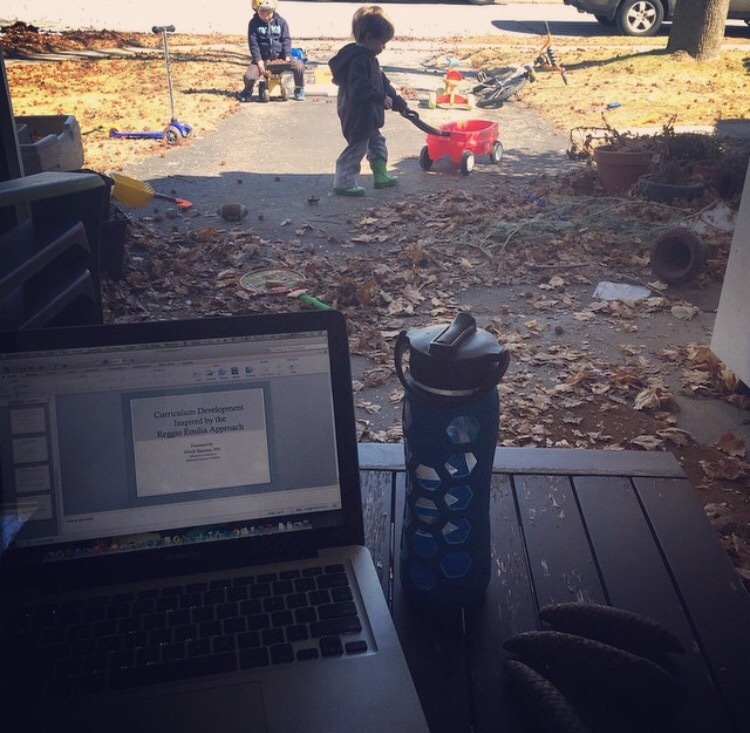 On this particular day, I was doing some organizing in the garage while the boys were riding bikes and scooters. The garage is attached to the house and faces the street where they were riding on the side walk. They would ride past the garage about every 60 seconds or so but were also busy yelling to each other about who was winning the race, so on this day, I had either eyes or ears on them at all times. And, to be honest, this is not even always the case. I often work outside while they are playing which means I’m staring at my computer while they ride or chase or climb. It was time to go inside for lunch, so we were cleaning up the toys when a police car came down our cross street, which was odd. Then they turned into our circle, this was very odd. Then they pulled into our driveway. What is going on??? I don’t think I said anything at all because I could not process what was happening. He quickly followed up with, “But, it looks like they are being supervised.” I said something to the effect of, “I was in the garage” and pointed in it’s direction. He took a quick glance around and decided everything was fine. As he pulled away I realized I was shaking and the boys were looking at me. Looking at me for an explanation of what happened and for clues on how to act. I’m sure they could sense that I was stressed, upset, confused and instead of thinking, ‘hey, cool a police car!’ they were clearly concerned. We went inside and I explained as best I could that he was just checking up on us to make sure everything was okay. Luckily, that satisfied their innocent little minds and they moved on quickly. I gave them some food and sat them in front of the TV. I sat down and tried to process what had just happened. Someone drove past my house and saw my 2 year old riding his scooter and assumed he was outside by himself. They didn’t stop their car and get out. They didn’t assess the situation to make sure he was safe. They didn’t knock on my door to make sure everything was okay. They didn’t even call out to see if there was an adult within ear shot. They called the police and drove away. They felt that this child was in need of police care but not their care. Was it not important to them what actually happened to him? They were concerned enough to call the police but did they not feel some responsibility for his safety? Did they think that their 30-60 second evaluation of the scene was enough to assume negligence or abandonment? All I could think was ‘where do I live and who are these people around me that would do this?’ They placed a judgment on me and/or my child’s safety but showed no concern for our actual well being. This is my village? This is my community? I was very, very upset. I couldn’t help but think that if something had actually been amiss that day, if my son had gotten out without my knowledge, if something had happened to me… That the one person who drove by and saw him and thought he was alone would have just driven away because it wasn’t their problem. It took a while for me to stop harping on it in my own head, and now writing about it all has me agitated all over again, but I think it’s important for us all to remember to look out for each other. Try not to assume the worst but if you do, dig deeper. Get out of your car and look around. The view from our garage. 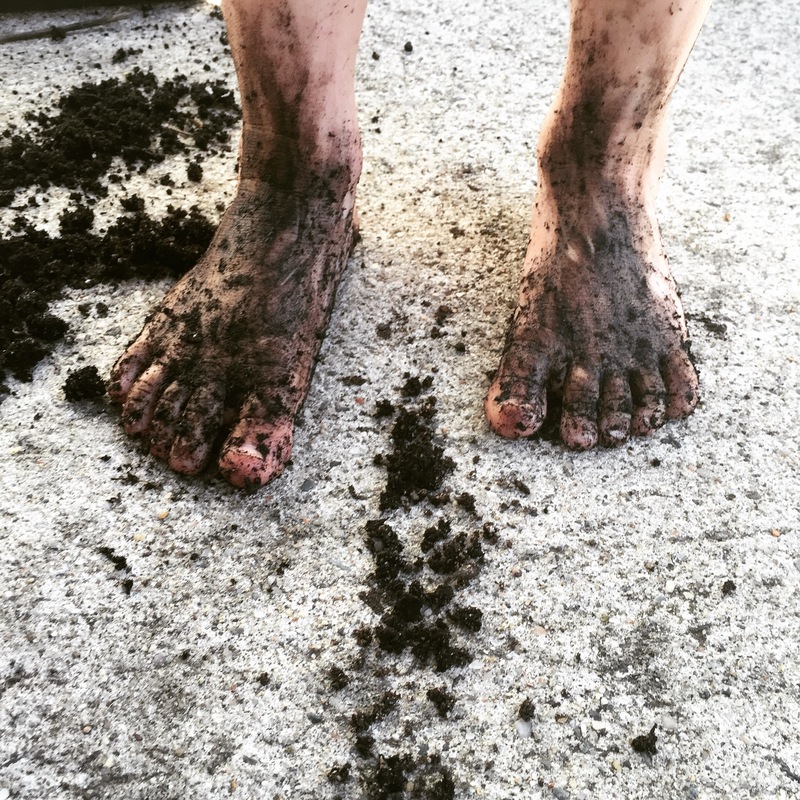 Last spring I knew I wanted to add some type of mud play area to our yard. 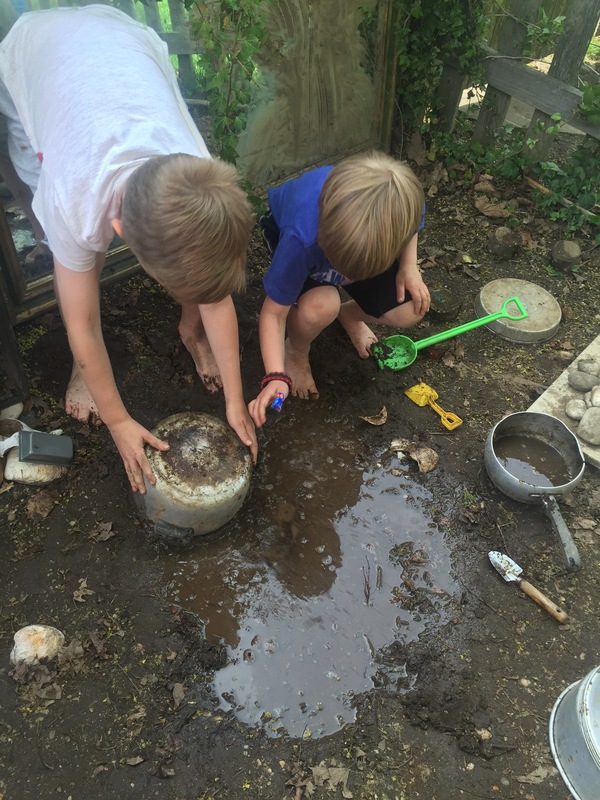 My boys had started exploring with making mud on their own and I wanted to encourage that play to continue and develop. 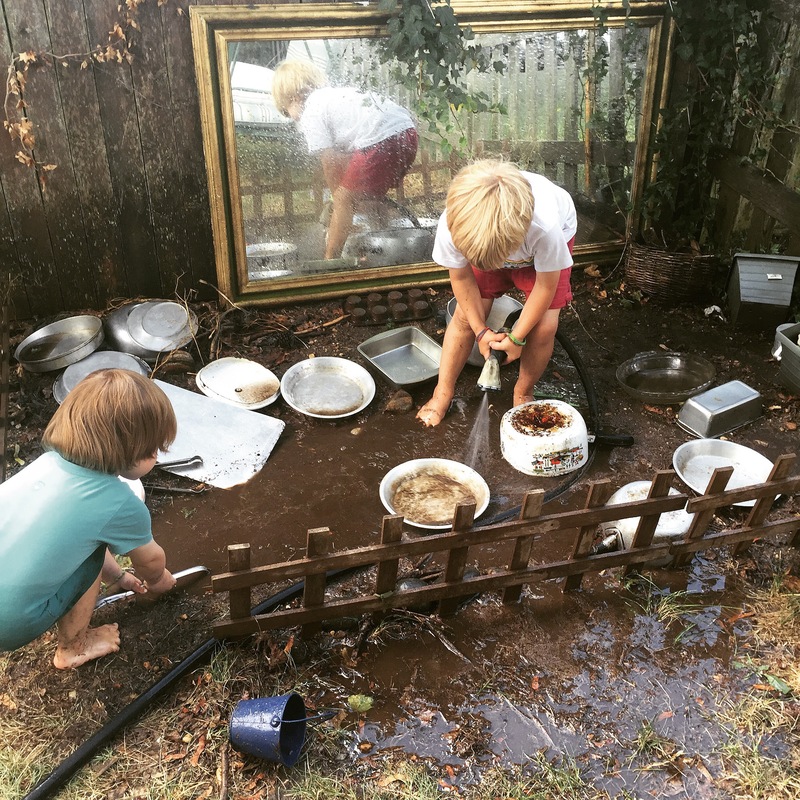 There are so many benefits to mud play so we welcomed the mess that would surely came along with it. 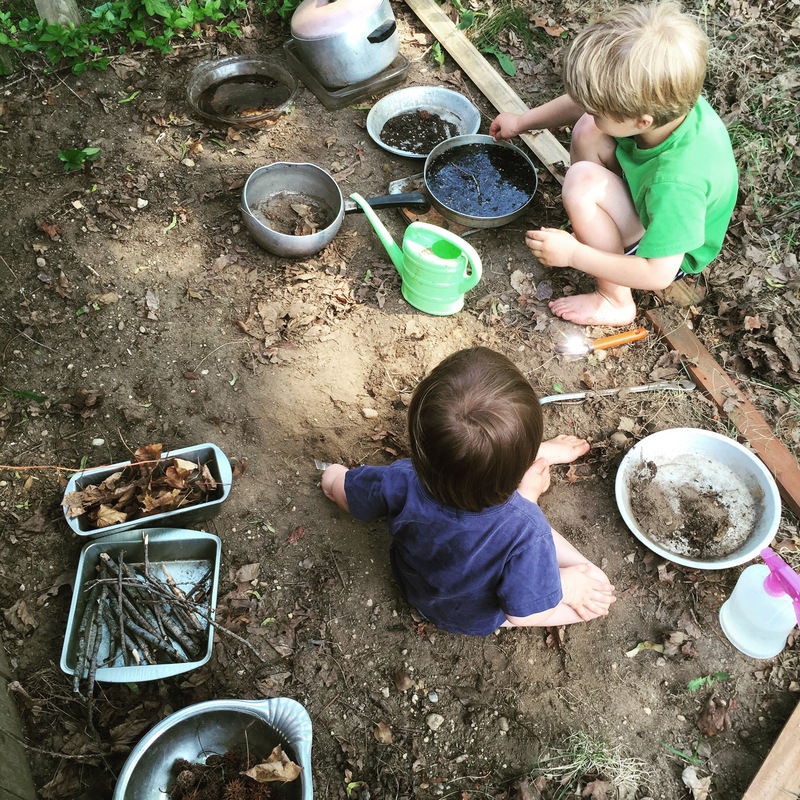 I opted instead for a ‘mud pit.’ A clear space for entirely open ended play and exploration. 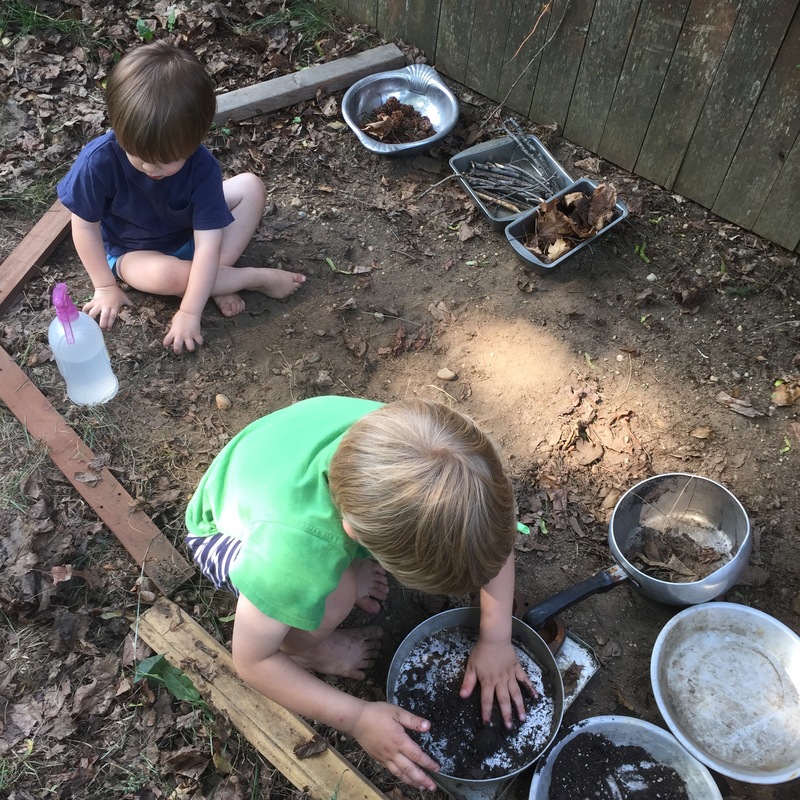 I wanted the boys to be able to make mud pies and dandelion soup but also to drive their trucks in the mud and set up construction sites and use all of their creativity and imagination. 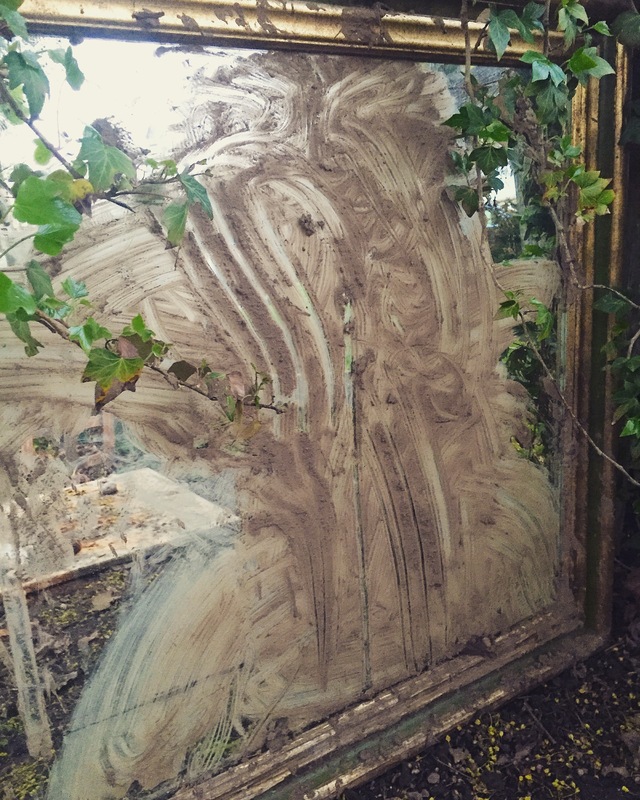 So, a mud pit it was. 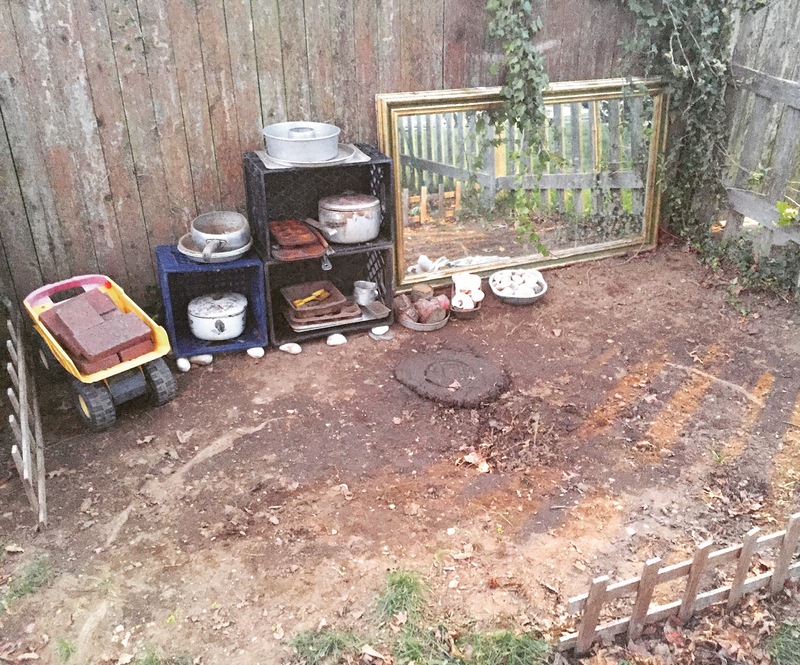 Once I added a mirror (that I picked up from the side of the road) and some fencing to define the space, our mud pit was complete. And, also, while it adds to the messy factor by about a thousand percent, I like that they get to sit in it, squish their toes in it and have freedom to explore. For us, this set up has worked well. 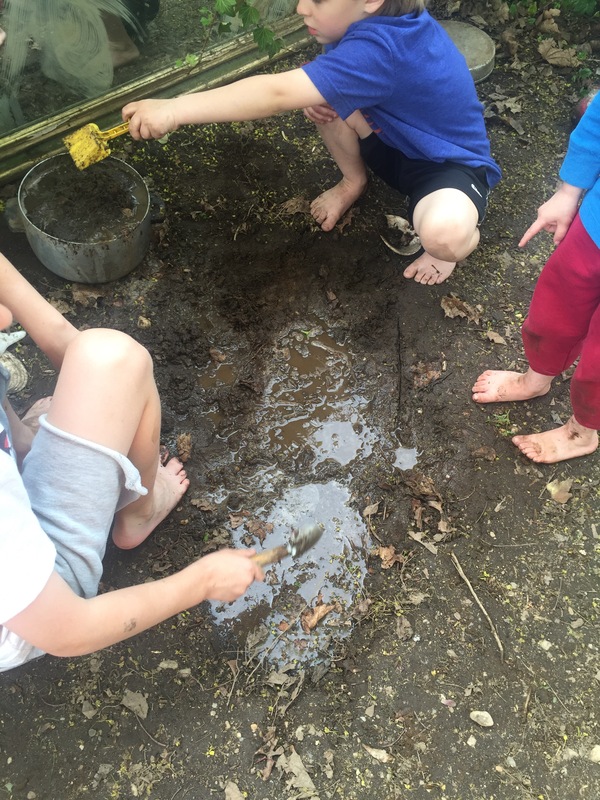 The mud pit was a huge hit last summer and early this spring the boys, and our neighbors, were excited to get back at it. 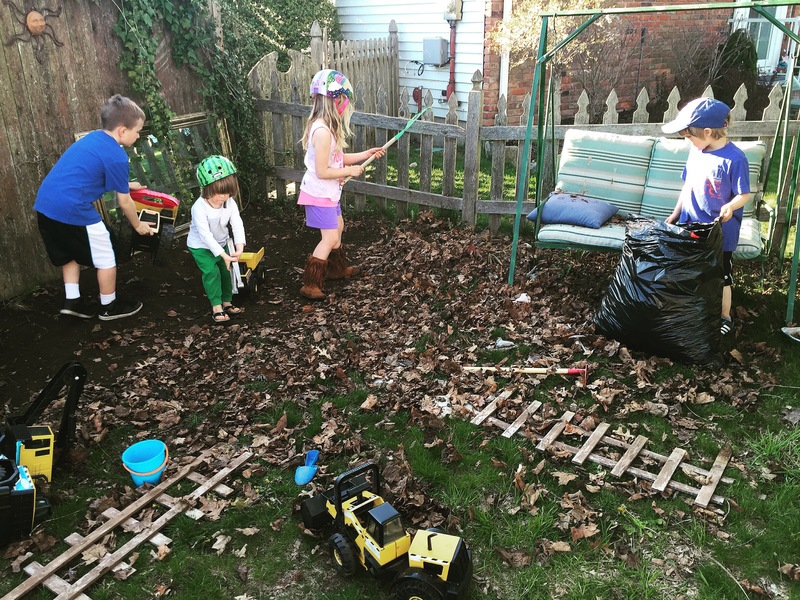 So excited, that they spent the better part of a day in April raking all the leaves and cleaning out the entire area, all on their own. We made a few adjustments this year, making the space a little bigger, adding milk crates to organize pots and pans. 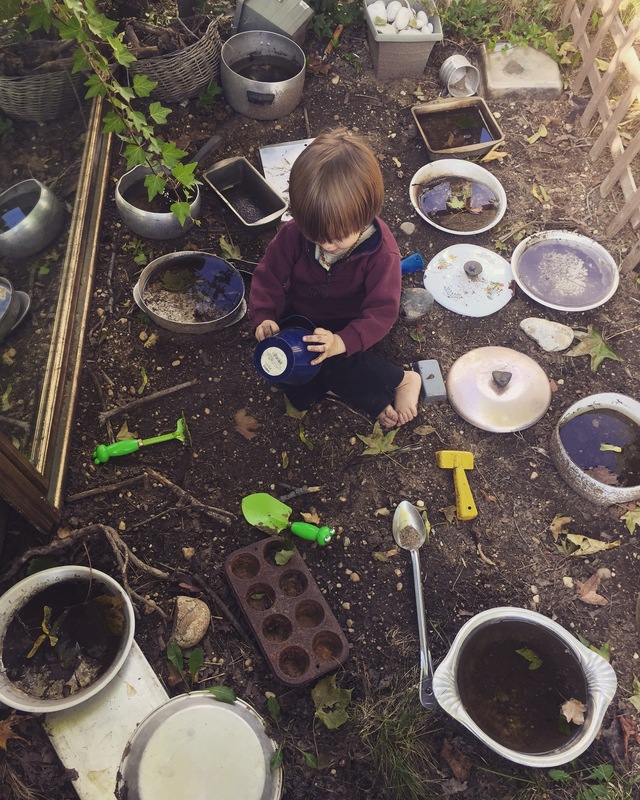 In addition to traditional kitchen ware, I added loose parts like bricks and rocks, shells, sticks and other natural materials. Their metal dump trucks were placed nearby and the sit on digger has been dragged over for construction work. 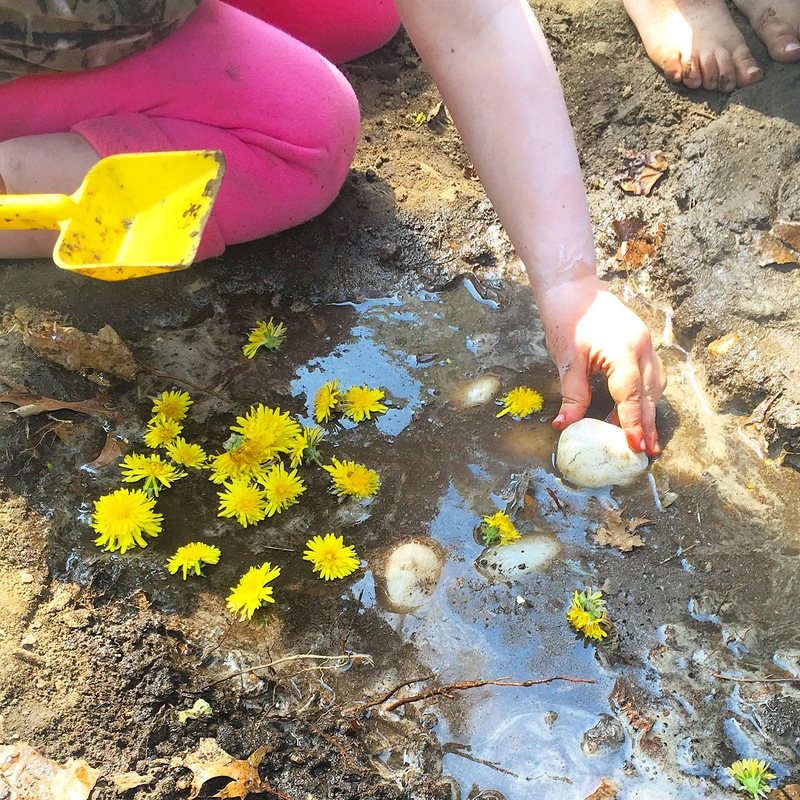 So far this year, they have made their mud muffins and soups, dug pools for worms, built castles, made ‘poo pies’ (don’t ask), done finger painting on the mirror and made tracks with their trucks. I can’t wait to see what they come up with in the coming months. 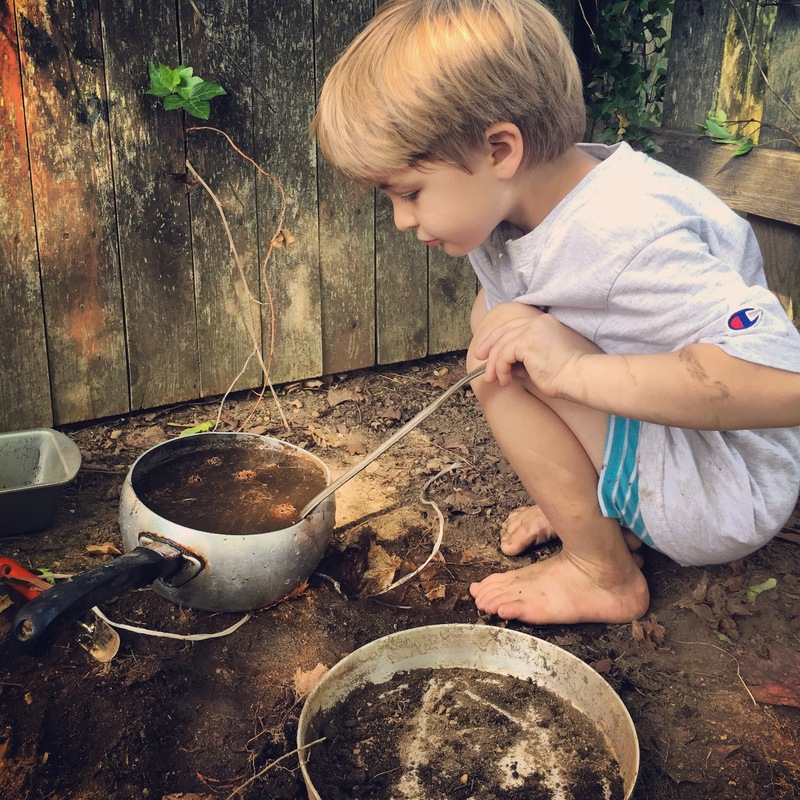 I wanted to share our experience for those families or schools that want to incorporate mud play into their children’s lives but don’t think that a mud kitchen is the right fit for them. 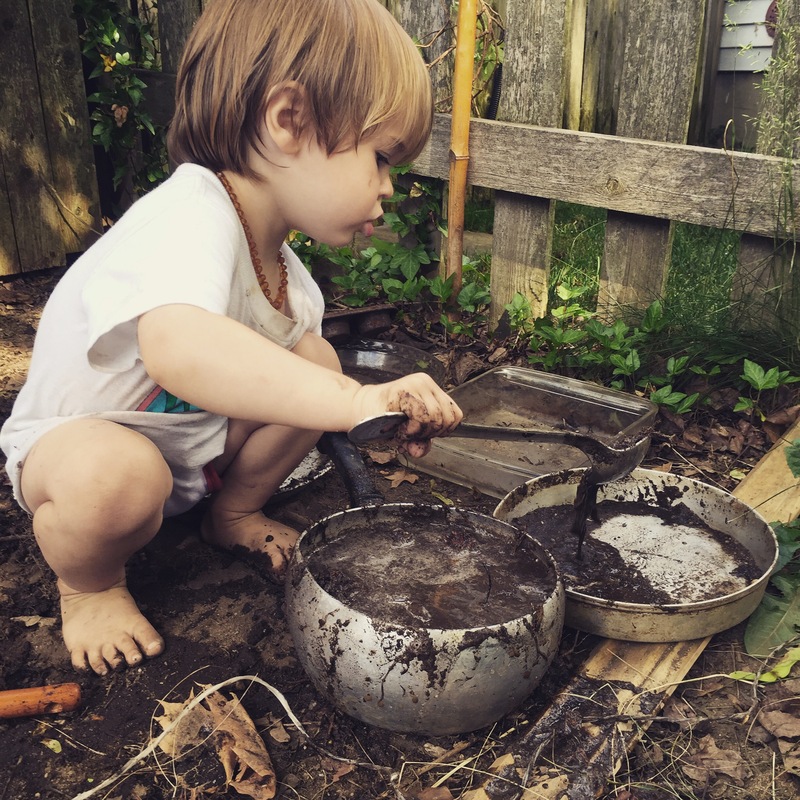 An open space with dirt, a few pots or buckets, maybe some spoons or shovels and water is all you need to experience the sensory rich exploration of mud play.